GORE-TEX® footwear engineered with SURROUND® product technology offer 360 degree climate comfort. They are highly breathable all-around without compromising on durable waterproof protection. Your feet stay dry and comfortable even at warmer conditions. Moisture and warmth are not only conducted via the upper of the boot, but also downwards through the GORE-TEX® laminate into a ventilation grid. From there they can escape through large side sole openings. We find that TCX boots are generally an easy fit and they are consistent from one model to the next. And we have very good luck using their size chart to convert from US sizes to their Euro size. Go here to view the TCX Sizing Conversion Chart page for help in choosing a size. We estimate the width to be about “D” or medium. 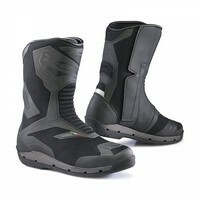 These are slightly more wide than Sidi boots and fit much like Alpinestars.